BAPI Duct Flexible Averaging Units come with a BAPI-Box Crossover enclosure. They feature closed cell foam to seal the probe insertion hole and absorb vibration. Mounting tabs allow for easy installation to the duct. The enclosure carries an IP10 rating or IP44 with a knockout plug or liquid tight fitting in the open port. 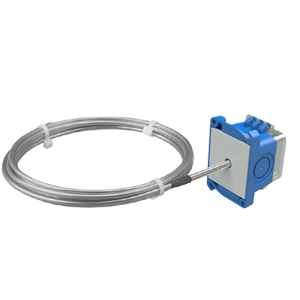 Averaging probes should be used wherever there is a chance for stratified layers of hot and cold air. Averaging probes are made of bendable aluminum tubing and measure temperature along their entire length. Nylon tie straps are provided for mounting.